Simply contact your provider and follow the pre-recorded prompts. Some companies will have a live operator to assist you with your call for emergency electrical service; and, others will simply give you an estimated time for a service truck to come out. Whichever way your call is handled, make sure you write down the work order or confirmation number you’re given. Estimated time for your service provider to come out is over two hours; AC Electric is almost always available within two hours for emergency electrical service. 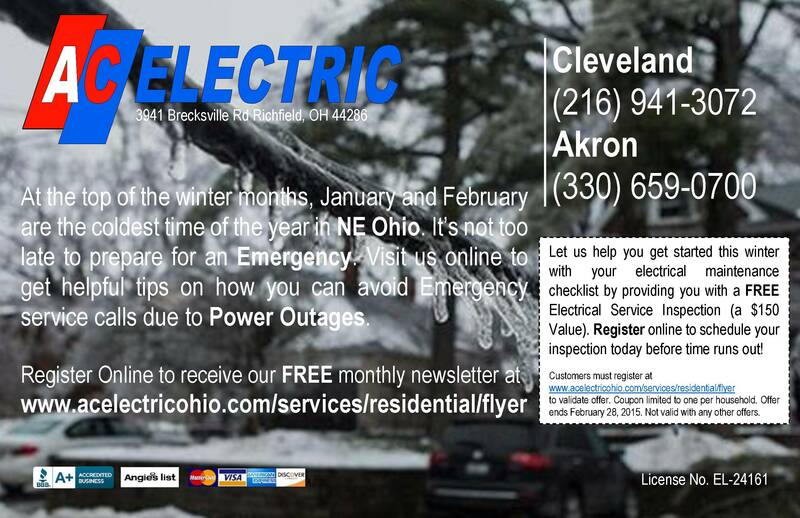 Are there icicles forming on your electrical lines? These icicles can put a heavy strain on your cable support attached to your home; and, can eventually snap off. If your cable support detaches from your home, your second back up would be the strap holding your home’s supply lines. Although the strap is not meant to support the cable, a well secured conduit has made the difference between re-supporting your cable support to having to replace your whole electrical service! Take a look at your cable support and make sure it looks secure. Then check your conduit support and make sure there’s one located as close to the weather head (service entrance cap) as possible. Are the wires that are insulated exposed? If the live wires are exposed, they can cause a short by making contact on your aluminum siding, or in either rainy conditions, snow collecting on them, or ice buildup. Ensure there are no exposed live wires which are insulated all the way around. The neutral conductor is the bare wire (no insulation coming from the pole) and is not required to be insulated. Are there trees around your service lines? Avoid a haphazard—get tree limbs running over your service lines cut before they snap and take down your service. Heavy winds and snow storms are the major culprits of these circumstances. Is your meter base not level? Service laterals (underground services) have a tendency to pull your meter base when the earth moves/settles. When the conduit pulls your meter base, it can cause tension on the conductor it protects and cause an underground short. Avoid an expensive repair by having your electrical contractor relieve the stress on your meter base and supply conductors by adjusting the alignment. Do you know how to check your breakers? Too often we get called out in the middle of the night due to a breaker or fuse tripping. Most emergency overnight calls are in cold temperatures; the common cause—cord and plug heaters. These units can draw up to 12-amps on a 15-amp or 20-amp circuit; connecting two units on one circuit will cause the breaker to trip. Although we have made suggestions to customers to avoid installing these units, they are still without failure for us receiving a call for service! Before attempting to reset your breaker or replacing a fuse on a power outage condition, unplug any appliances on the dead circuit. Once you have unplugged the appliances, reset the breaker. If you are unsure which breaker it is, turn off all breakers—including the main. Starting with the main breaker, flip it on, and do the same for all other breakers one at a time. If all breakers reset successfully, check if there is power back in the outlet(s) in question. If there is power, plug in your appliances one by one to verify why the breaker trips. If one breaker trips (goes back to the middle position), and all appliances have been removed, you will need to call a professional to resolve your problem. Is your furnace on its own breaker/fuse? 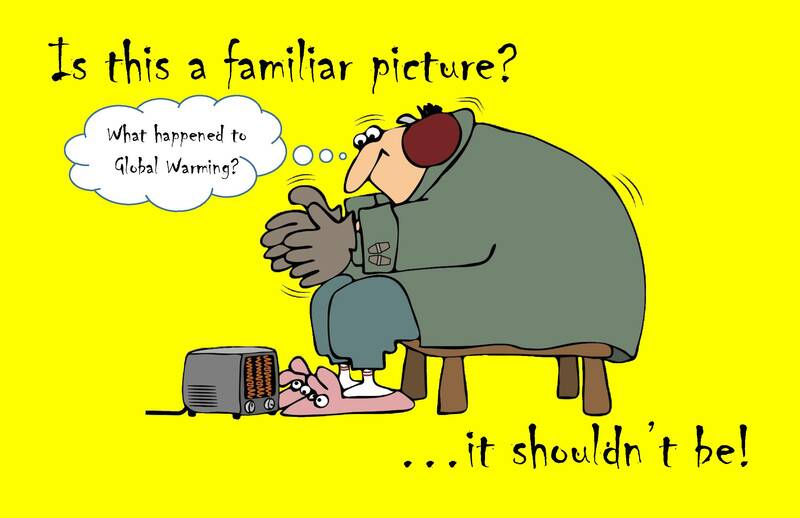 Our biggest concern when we get a call for service at any time is if your furnace is on the troubled circuit. If lights and your oven are off, you can survive for a few hours for a technician to come out in the morning to handle your emergency. To the contrary, very low temperatures can cause your pipes to freeze within a matter of a 2 or 3 hours! Make sure your furnace is on its own circuit in order to avoid emergency calls in the middle of the night. Do you have fuses or breakers? If you electrical panel is equipped with fuses, it is much harder for us to give you tips on how to check for a blown fuse. Some fuses may simply go bad and not show any obvious signs of malfunction without the use of electrical testing tools. We can’t advise the proper usage of these tools since there is a potential shock and/or electrocution hazard. Our suggestion to you would be to have your electrical panel replaced. With a service upgrade from AC Electric you get more power availed to you, a full service grounding and a lifetime warranty on the installation. Additionally, you would get the peace of mind knowing there are no fuses to replace which can be confusing alone. Preventive maintenance and planning is paramount in order to avoid expensive and inconvenient emergency electrical service calls. AC Electric wants to help you get started by offering you a free electrical service inspection—a $150.00 Value! Register today to schedule your inspection; offer ends February 28, 2015. AC Electric has been around since 1999 and we have over 700 residential customers alone (not including commercial). Call us today so you can be one of our satisfied customers; we want to be your emergency electrical service, maintenance and solutions specialist!